Lancaster City boss Phil Brown has warned his side that everyone’s out to knock them off their perch. The Dolly Blues bounced back from defeat to second placed Trafford with a 2-0 win over Colne on Tuesday night to reestablish their six-point lead at the top of the Evo-Stik First Division North. It was a marked improvement from Saturday when the Manchester side ran out 1-0 winners at Giant Axe. “As a group we’ve got to understand teams now see us as a scalp,” said Brown. “They raise their game, like we did last year against Warrington and Northwich Victoria. “There’s an extra edge to the games and the players need to take that on board. “Certainly when we’re playing teams around us, they can’t afford to lose points to us. “We need to be a little bit more savvy. “We’ve got to perform and be ready for the challenge and we were on Tuesday night. 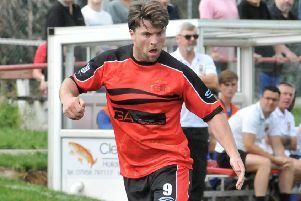 “Colne needed the points to close the gap on the top five and on us. City may be leading the way ahead of the trip to third from bottom Prescot Cables on Saturday but Brown insists the pressure is on the sides looking to close the gap. “The pressure is on the clubs chasing,” he said. “Why should we feel any pressure? “We need to be as natural as possible and keep doing what got us into this position. “Lancaster City haven’t been close to getting out of this league too often. City have been bolstered by the return of Paul Jarvis on loan from Chorley, the winger having been a firm favourite at the club when Brown was assistant to Tony Hesketh. “He came on for 25 minutes on Saturday which whetted his appetite and then he did really well against Colne from the start,” said the Blues boss. “For the first half an hour he terrorised them down the left-hand side. “His general play was good, he worked hard and you can see the quality he’s got. Brown has an almost fully fit squad to choose from against Prescot. Captain Ricky Mercer has suffered a recurrence of his calf injury but Rob Henry is available again after his Achilles problem.